The North Atlantic Right Whale (Eubalaena glacialis) is a large baleen whale hunted to near extinction for their oil by early whalers. Today there are less than 450 individuals making them one of the most endangered marine mammals in U.S. waters. 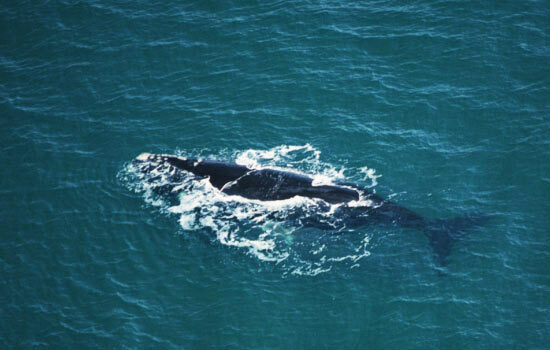 The continental shelf waters off Georgia and Florida are the only known calving area for North Atlantic Right Whales (present November through April). They can reach up to 55 feet in length, weigh up to 70 tons, and are identified by their lack of a dorsal fin, v-shaped spout, and distinctive patches of rough skin on their head called callosities. If you see a Right Whale please call 1-888-97-Whale. Nearly all of the few remaining North Atlantic right whales occur off of eastern North America. Two other right whale species occur in the Pacific Ocean and the Southern Hemisphere. Entanglement and vessel strikes are the leading causes of death for North Atlantic right whales. Entanglement in rope and net from commercial fishing gear causes debilitating injuries, infection, and prolonged death. Modifications to fishing gear, area and seasonal fishery closures, and reducing the amount of fishing gear in the water, especially rope, can help reduce entanglement. Conservation efforts and regulations to reduce fatal vessel strikes include routing of ships and reducing vessel speed in areas when and where whales are known to occur, as well as alerting mariners to the presence of whales. North Atlantic right whales keep close to the coast. On their migrations between summer feeding grounds in Canada and winter calving areas off Georgia and Florida, the whales pass close to several large metropolitan areas with busy ports. If observing from the beach you are looking for a large long black object moving across the water. This is typically referred to as "gatorin." Once the whales reach our waters they don’t typically breach because their energy is focused on calving and feeding their young. 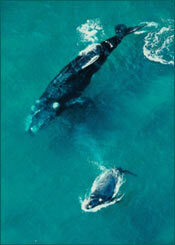 Approaching whales or remaining within 500 yards of them is against the federal law. If you see a Right Whale please call 1-888-97-Whale.